Former prisoners and relatives of the hunger strikers were among those at the rally to commemorate the deaths of 10 republican prisoners in the 1981 protest over political status at Long Kesh in County Antrim. 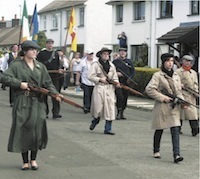 Dozens of bands led a pageant parade through the village with leading Sinn Fein figures, including Gerry Adams and Martin McGuinness, in attendance. The following is the full prepared text of Martin McGuinness’s address. I want to take this opportunity to extend a huge welcome to you all, it is a great honour and privilege for me to address you here at what is always a hugely important, significant and emotional event for us all. I am particularly honoured to be addressing this national event here in the village of Bellaghy, where all things Irish are not just respected but are promoted and enjoyed. This is a proud republican community, who, in the most difficult days of our struggle rose up in defiance of Britain’s failed entity that was the Orange State. Bellaghy continues to play its part in the pursuit of freedom and independence. I have the great privilege to be the elected representative of the people of South Derry and East Tyrone since that historic election of 1997 when the electoral map of the North was profoundly impacted in a way which is continuing to be felt to this day. Likewise the impact of the 1981 Hunger Strike continues to be felt to this day with Michelle Gildernew representing the constituency of Fermanagh/South Tyrone won by Bobby Sands at the height of the Hunger Strike. This is a huge turnout and we thank you all for coming here today. Ireland’s four provinces and all our 32 counties are represented here today. Go raibh mile maith agaibh go leor. A particular welcome to all of you who have travelled long distances to be with us. Maith sibh. I want to express our thanks and appreciation to everyone who contributed to this weekend’s events in honour of the Hunger Strikers. A lot of time and effort by local republicans, supported by the local community has done a great service to the memory of the Hunger strikers, each and every one of them a colossus of our struggle. Irish history has seen many phenomenal events and this is the 29th anniversary of what was one of those events. The deaths of the Hunger strikers has left an indelible mark on all of us. In particular the relatives of the Hunger Strikers suffered most of all. They suffered grievously but bear with each passing year the huge sense of loss to themselves with great dignity and pride. Our respect for them knows no bounds. We are mindful too that many other families suffered loss as the result of conflict on the streets during the Hunger Strikes. Five of the Hunger Strikers came from County Derry. Twenty nine years ago, in the summer of 1981, the eyes of the world were on Derry. On five occasions the republican people of Ireland descended on the county to pay their respects to the families of IRA Hunger Strikers Francis Hughes and Tom McElwee and close by in Dungiven and Derry City when INLA Volunteers Kevin Lynch and Patsy O’Hara were laid to rest. Twenty nine years on we are back here today, in Bellaghy, a republican community unbowed, unbroken and here in a spirit of ongoing solidarity and comradeship. And 29 years on - here where Francis and Tom grew up, joined the IRA and fought the British in, we are joined by the friends and families of the eight other men who died in the H-Blocks in 1981 and also friends and family of Frank Stagg and Michael Gaughan. And today is not a day for big political speeches. It is a day to remember our comrades, to reflect on our struggle but primarily to pay tribute to the families of the Hunger Strikers, to extend our ongoing admiration and solidarity to you and thank you again for your steadfast support over many long years. The Hunger Strikers and everything that they represent continue to be an inspiration to us all today; it is worth noting that following the death on Hunger Strike of Terence MacSwiney that Ho Chi Minh praised him as an example to be proud of. The legacy of the Hunger Strikers sustains the struggle for freedom and contributed greatly to building the conditions where we now have the opportunity to complete the journey without our young and bravest giving their lives or spending their youth in prison camps. Their names are known and revered across Ireland and the world, in America, South Africa, Europe, the middle-east and beyond. Our recollections of the Hunger Strikes are painful but, nonetheless, precious. Time numbs little of the sorrow and sense of loss we experienced as, one by one, our friends and comrades died on Hunger Strike. Nor does time diminish in any way the value of their sacrifice. The Hunger strikers focused the eyes of the world on the political conflict in Ireland, and our struggle increased in legitimacy both at home and abroad as a consequence. Britain’s hold on Ireland was severely weakened. And while many of us knew some of the men who died and have heard countless tales of the others - of their bravery on the outside and their courage inside prison as they confronted Thatcher’s intransigence and her attempt to break the struggle - and while we lost comrades we must never lose sight of the fact that it is the families who live day and daily with their loss. It is important also that on days as significant as this we should also remember the families of all our patriot dead; we say to them today that we stand with you, we take courage and inspiration from you and we will continue on the path made possible by the sacrifice of your loved ones. Over the course of the next short period people will be marking the 30th Anniversary of the 1980 and 81 Hunger Strikes. It is important that 1981 Committees are up and running in every area. Just as our opponents attempted to criminalise these brave freedom fighters in life, have no doubt that as the 30th anniversary approaches, the revisionists will be out in force trying to once again criminalise them and our struggle. It was Bernard Ingram, Thatcher’s chief spin doctor who said that Thatcher came to regard Irish Republicans as less than human, as criminals and should be treated as such. We need to be ready and prepared to counter their lies, their propaganda and their attempts to legitimise the positions they adopted in 1981 and since. The message needs to go out very strongly that we are not prepared to see the memory of Bobby, Francis, Raymond, Pasty, Joe, Martin, Kevin, Kieran, Tom and Mickey sullied or used or abused by anyone. The 1981 hunger strike destroyed Britain’s strategy to criminalise the IRA and the republican struggle. After that in the 1980s they began a policy of attempting to terrorise our people through a campaign of assassination and murder carried out by British surrogate death squads and attacks on republican funerals, and more. But as in 1981, they fundamentally miscalculated. Yes, they killed leaders like John Davey, Sheena Campbell and Bernard O’Hagan, but they could not kill their spirit or their legacy. Ideals can’t be assassinated. Determination and commitment cannot be imprisoned because we carry these things in our hearts and minds. Just causes are never defeated. The proof of that is all around us today, the spirit and legacy of 1981 continues to inspire. From 1981 to the present day the legacy of the Hunger Strike has been the bedrock of our strength. Today, the inheritance of our dead comrades is all around us as we pursue the new goals which we have set ourselves. Bobby Sands, Francis Hughes, Raymond McCreesh, Patsy O’Hara, Joe McDonnell, Martin Hurson, Kevin Lynch, Kieran Doherty, Tom McElwee and Mickey Devine were not defeated or broken. Neither was Frank Stagg or Michael Gaughan. And neither will our struggle and our political strategy. They proudly take their place alongside Pearse, Connolly, Clarke and the rest of the signatories of the 1916 Proclamation - they were the history makers of our generation. They are the people who have set the moral compass for the rest of us to aspire to. That is their legacy - just as The Proclamation set out a vision which continues to inspire so too did the Hunger Strikers. Their ideals have yet to be fulfilled, but they also remain timeless. The task of today’s generations is to translate them into action. We must always do more. Bobby Sands wrote of the need for everyone to play their part; that no part was too great or too small. Our objectives are about a better Ireland, a reunited Ireland, a new inclusive society - and a new national Republic based on equality, freedom and justice. That is the monument we must build to the Hunger Strikers and all of our Patriot Dead. One of the most encouraging aspects of this phase of our struggle has been the numbers of young people attracted to our struggle. A new generation of activists are taking their place in the struggle and we must ensure that place is secure. We are the only party which has experienced such growth, and it is a sign that young people see our party as a vehicle of change for a new generation. Many of our activists who gave their lives over the past four decades, including the Hunger Strikers were young men and women; they made a brave choice in life. They could have chosen a different path. It is worth remembering also that they were ordinary men and women like any one here today. But they rose to an extraordinary challenge. There are young people standing here today who have that extraordinary ability to give leadership but don’t yet know it. We must continue to lead; we must strategise and use tactics suitable and workable to the 21st century, to 2010. There are lots of potential allies out there. The prison protests in Armagh and the H Blocks brought together many people who disagreed with us on other issues. The Hunger Strikes became a catalyst for a huge mass movement. In dire economic times, not dissimilar to today, prison candidates received substantial votes with Bobby Sands elected MP and Kieran Doherty and Paddy Agnew elected TDs. So while building Sinn Fein, we also have to help build with others - an alliance for change. We have to come together with others to forge a stronger, united, progressive and democratic movement for our country - one that aims to meet the needs of all citizens. Just as we did in that long hard summer of 1981! Together we need to do it again now. We are proud of our past, stronger in our struggle today than ever before and confident in our future. Together we will achieve Irish unity, independence and sovereignty. We will live in the Irish Republic that our comrades sacrificed their liberty and lives for in the H-Blocks 29 years ago. Bigi Linn, Tiocfaidh Ar La!